Japanese garlic ginger grilled chicken brings the clean flavours of soy, sake and sugar to a backyard classic. A little bit of chili sauce adds a bit of bite to what should become a backyard classic. There’s just something about grilled chicken that makes me smile. Not really sure why but I love it. I’m always looking for new ways to spice up the blank canvas that is chicken. Garlic ginger grilled chicken is the latest addition to my palette. This is a simple recipe. But sometimes simple is great. Japanese cooking in general is all about relatively simple ingredients and incredible attention to detail. This is no different. There’s nowhere to hide. 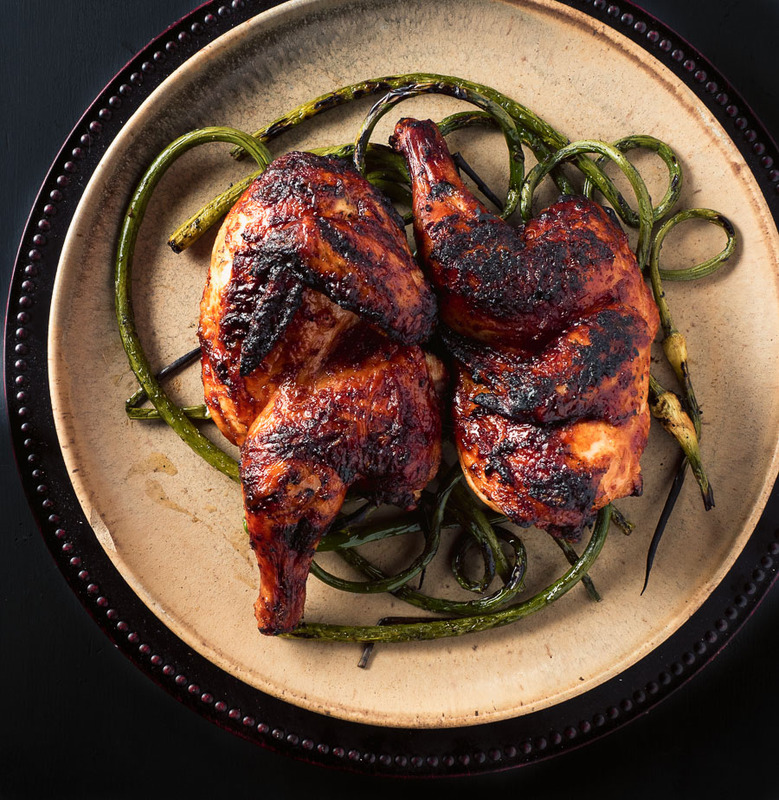 No sticky barbecue sauce to hide the fact you burned your chicken. There’s nothing to it except your grilling skills. Mix up a marinade. Grill. Baste. Eat. But the flavours are anything but simple. Savoury, assertive, salty, delicious. There’s sugar in the marinade. Sugar burns. That’s why putting barbecue sauce on early is pretty much a guarantee of golden black chicken. Add a few flare-ups and it’s cinder chicken. Nobody wants that. Medium heat. Giving yourself a cooler safety zone to move the chicken out of harms way. Close attention to what you are doing. These are the keys to success every time. Set things up so you have a medium zone and low zone. Start the chicken skin side down over direct heat for the first two minutes to get a bit of colour and some grill marks. Then move it to the safe zone and cook it there. Maybe bring it back over the medium zone a couple times along the way but don’t leave it there to burn. Vigilance is key. 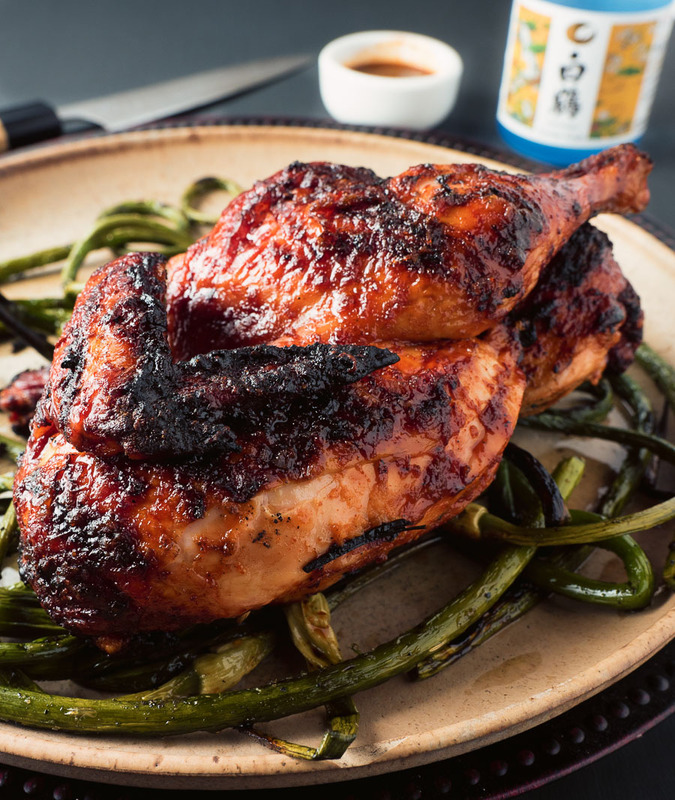 Garlic ginger grilled chicken is an easy way to bring the flavours of Japan to your backyard. 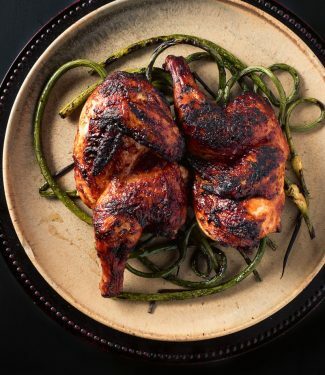 The Japanese have been grilling chicken for centuries and this garlic ginger grilled chicken adapted from Tadashi Ono's recipe is a great way to experience it western style. Use a high quality Japanese soy sauce - and light soy (low sodium) is not a bad idea. Combine all the ingredients except the chicken and stir well. Place the chicken pieces on a baking sheet (something that can hold all the chicken in one layer) and pour the marinade over the chicken. Flip the chicken every ten minutes. Do this 3 or 4 times. Prepare your grill. If using charcoal (that is way better) build a two stage fire. Medium on one half and low on the other. If using gas just use the knobs to set up the same idea. It won't be as tasty but it will still be good. Grill the chicken over direct medium heat skin side down for about two minutes. There is sugar in the marinade so it will burn. Watch it closely. Flip the chicken and move it to the low side of the grill. After 10 minutes baste the chicken with the boiled marinade. Repeat this again after another 10 minutes. Cook until the internal temperature reaches 160F - somewhere around 25-35 minutes depending on the size of the chicken. Remove from the grill and let rest 5 minutes. Carve if needed. Serve. Enjoy. In bbq and grilling, japanese, main course, poultry. Bookmark the permalink. And I cannot wait to hear what you think! Hi! Thank you for an excellent idea! Do you think I can replace Sriracha on something else? You are very welcome. I use gochujang for this recipe and offer Sriracha as an easier to find alternative. Sambal oelek might work but that’s getting pretty far from the recipe. White miso with an asian chili sauce might be closer.